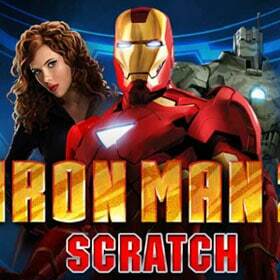 Iron Man 2 offers a great scratch card experience featuring characters from the hit movie. The aim of the game is simple: find three reactor symbols in a row to win the random cash prize. 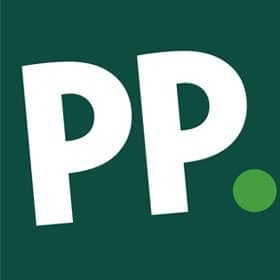 Fans of the Iron Man movie franchise will love this super scratch card from Paddy Power Casino.The Marvel revolution in hollywood has seen it's much loved characters get the movie make over and one of the most successful is Iron Man. There have now been three Iron Man films along with an Avengers movie and one in the pipeline. This scratch card focuses on the second Iron Man film although you can also play scratch cards and slots tied in with the other hit Iron Man film. First of all enter your stake for the game from between £1 and £10 then simply scratch each of the nine panels to see if you have a winning card. Then scratch away the prize panel to see what you have won. 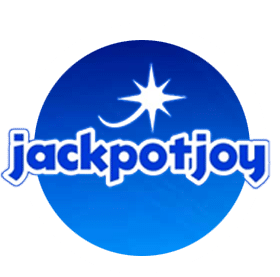 This card offers a auto play function which will allow you to automatically scratch through a given number of scratch cards to see if you have won. You can also shuffle the cards before each play. In terms of game variety this card doesn’t differ that much from regular scratch cards bought in store but where is lacks in gameplay it makes up in great graphics and sound effects and with the auto function you can play multiple games in a short space of time. Play this scratch card and many more like it at Paddy Power Casino & games online. 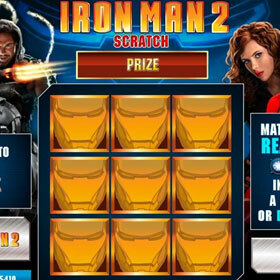 Along with this scratchcard they also have over 270 other great games to play, including the new Iron Man 3 slot machine. Check out the latest new customer offer below and get Scratching today.